Gizem was born in the industrial city of Hanau, Germany as the child of Turkish migrants. She is a graduate student at Goethe University in Frankfurt, enrolled in Political Science. During her under-graduate studies she spend a semester at Istanbul University. Previous abroad projects as in Hong Kong (meeting with trafficking victims) settled her interest in migration and gender, especially the intersectional-feminist approach. 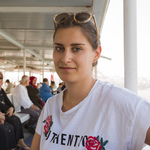 Recently she started an internship at Café Milena, a space for migrant (refugee) women*. She coordinates workshops and excursions about legal rights, a critical reflection of the environment and simultaneously to practice language skills. In her free time, you can find Gizem in the kitchen trying a new (Pinterest-) recipe for cakes or bread, or alternatively start watching a new series, which actually doesn't fit in her time schedule. After her studies she plans to remain with political education, focusing on structural racism in Germany.